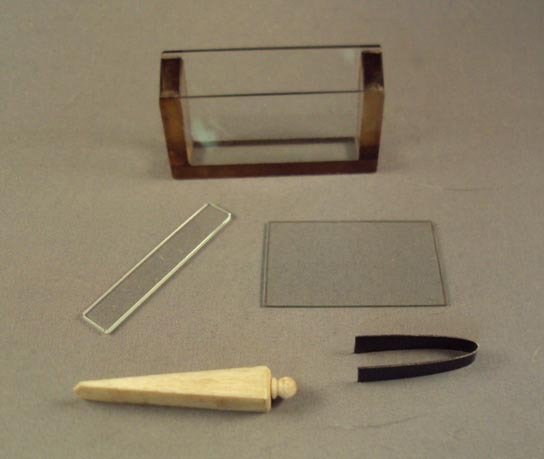 Microscopists have, over the years developed many types of accesories for viewing living organisms. The microscopist may have to move the optics or (as in this case) the stage to follow the organism. This particular instrument is specially-equipped just for this purpose; it has a White Universal Lever Stage movement. This made using the glass trough much easier. The trough is more complicated than a casual glance might suggest; it was supplied with several different parts to regulate the depth and perhaps the movement of an aquatic subject. 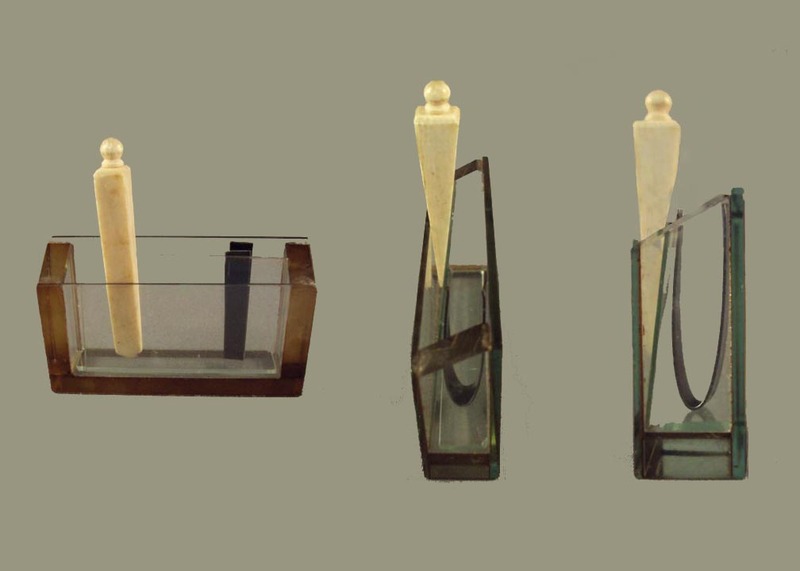 The parts are shown in the photos and include a small rectangular piece of glass which sits on the bottom, a larger rectangular glass plate which is held in place by the small piece on the bottom, so that the larger plate is angled in such a way as to permit the angle to be changed by an ivory wedge against the plate which is in turn in contact on the other side with a piece of spring steel. The lever stage movement replaced the original mechanical stage which had its movement restricted to the X or the Y axis; a combination of both at once would have required two hands and quite a bit of coordination. The lever stage allows the use of only one hand to move the stage in any direction. Although this microscope was delivered in 1840, the White Universal Lever Stage was not announced until 1843. In view of the racks from the mechanical stage still remaining, the Lever stage was likely added sometime after this microscope was originally constructed. It has been suggested that the lever stage would not have been added before White's announcement in 1843. It was a standard option by 1845 when supplied with Smith's number 99 which was sold to Goring. One of the first attempts to use a specialized Aquatic movement of the optics rather than the stage, was the much older Ellis Aquatic microscope. Moving the optics rather than the stage would be an advantage for certain organisms very sensitive to movement. (see an example of the Ellis Aquatic-type of microscope in this collection).